My daughter loves anything and everything SOFT. So it was no surprise that she would love Zoobies. What are Zoobies? Zoobies are cute stuffed animals, cuddly blankets and comfy pillows all in one! 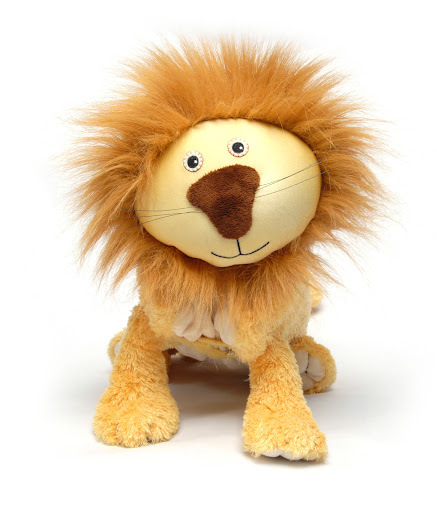 I was given the opportunity to choose one Zoobies Blanket Pet to review, and I decided to go with Lencho the Lion. My daughter is beginning to have likes and dislikes, and lions are one of her favorite animals! As soon as she saw Lencho, her lights lit up like she’s never seen a stuffed animal! She yanked it from my hands and started to cuddle with it on the floor. She then realized that she could unfold it and make Lencho into an awesome blanket! My 21-month daughter is in love with Lencho the Lion, as I’m sure your children/grandchildren will be, too! Zoobies make a sweet baby shower gift or an exciting birthday present! You can purchase a Zoobies Blanket Pet for $35! Use the discount code “parenthood” to receive 25% any Zoobie product! Really love Clifford the dog! I found this awesome giveaway from your email. Thanks! you do not have spaces to put anything including blog addys, special code numbers or email addy so the spaces have to be put into the form, because you said people will be banned if they don't list the code and there is no where to put it. I like Hada the Hippo! Happy New Year! Thanks so much for the fantastic giveaway! I found this at online-sweepstakes. Thanks! I found this in my email. I'd choose Hada the Hippo. Thanks. I would choose Mashaka the Monkey, he is so cute. Found this on Contestgirl.com. Thanks. These are all SO cute but if I can only pick one I'd pick the Hungry Caterpillar! I found this giveaway via your email! I would choose the Lola The Lamb. I would choose Wyatt the Wolf. I like Clifford the Big Red Dog. I'd choose Pugs the Pooch. So damn cute and I have never seen those before!!! If I don't win the raffle I will have to order one for my son! I would choose the Curious George. I would get Ellma the Elephant! found this giveaway while entering another on your blog. entered go green champ, ecover, dino dan & train2cheer. Found the giveaway on your blog sidebar! Entered the Crane and Zoobies giveaways. I would love to get Flavio the Frog. I found this giveaway in email. I found the giveaway in your email. Wyatt the Wolf looks perfect for a cozy snuggle in this cold weather. I love poco the pup! i'd choose patch the pinto or cookie the cow! So many cute ones… I'd probably choose the giraffe. I found this giveaway from change-diapers.com which led to me to another giveaway on your blog. Also entered Crane Humidifier giveaway and GoGreen Diaper giveaway. I found out about this giveaway from an email I received from you. I will probably pick the “Caliel the Camel™.” I'm not sure though, I'd have to get a true answer from my daughter before submitting my true pick, for this would go to her. I left a comment on your “Vortex Color Changing Toothpaste – Review!” blog post. I'd choose Hada the Hippo. I found this giveaway by following the link on Coupon Boss. Miss Amber…I received a *Special Code/Secret Code* from you this evening (1/14/12), but there is NO space to leave that *Special Code/Secret Code*. I found this contest on OLS. I like Wyatt the Wolf zoobie. If lucky enough to win, I would choose Furbie the Feline for my granddaughter! I found this giveaway in your newsletter! I would get kojo the croc for my son! I found this giveaway after I arrived here and saw this. I entered the train 2 cheer strengthen and condition Dvd, Dino Dan, and Dale and Thomas giveaways. I would choose the monkey blanket. My younges son lives monkeys. Wyatt the Wolf is who I would choose. is where I found this giveaway. I entered Fun with Felt giveaway. I would choose Lola the Lamb. Too cute! Found this giveaway in your email. I found your contest from a Facebook post. i'd choose Lencho the Lion. His hair stands up just like my 6 months old, it looks like his twin. I would get Bubba the Black Bear, or Puddles the Pig. I'd choose Curious George! Thanks so much for the fantastic giveaway! I like Kojo the Croc. I would LOVE LOVE LOVE the Giraffe!!! the frog one! My son is obsessed with frogs! I like Hada the Hippo! I love Furbie the Feline. Christina – xristya@rock.com – Gamba the Gazelle! Christina – xristya@rock.com – I found this on http://www.online-sweepstakes.com! I really love Flavio the Frog. Love these blankets!! my daughters will go crazy over these! I would get Clifford for my older daughter and poco the pup for my younger! I would pick Coduroy the Bear if I won. Thanks for sharing! I would choose the panda bear! I would love to have Clifford for my son. I would choose Hada the Hippo. I found this giveaway on twitter. I follow you on Google+ as Kimberly Colby. Thank you! I would try the hippo! Khimba the koala and baby kai! 😀 THanks for the giveaway!! I'd love to get Ping the Panda. These are so cute! My nephew would love one. Thanks for introducing me to them. My daughter would like Clifford. I would pick Mashaka the Monkey. Too Cute! my daughter wants the camel so bad! I found it on online sweepstakes. I entered the Pine Bros giveaway. Name That Toon Contest from Crane USA!! !